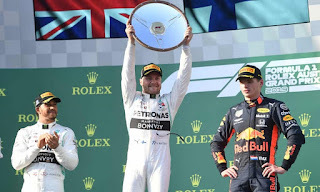 Mercedes Finnish driver Valtteri Bottas wins the Formula One Australian Grand Prix in Melbourne on March 17, 2019. His three previous F1 wins – taken in Russia, Austria, and Abu Dhabi in 2017 – all followed a similar story: soaking up pressure throughout the race, remaining ice cool under pressure and holding on for victory. The winning margins of 0.617s, 0.658s and 3.899s at those respective races tell the story themselves. The 29-year-old Finn could not buy a win last season and finished fifth in the drivers' championship as team mate Lewis Hamilton collected 11 on the way to his fifth title. With young Frenchman Esteban Ocon waiting in the wings as Mercedes' reserve driver, Bottas went into the off-season hounded by doubts and with speculation over the security of his race seat. He passed the break getting drunk with friends at home, growing a beard, taking a turn in a rally car and nurturing a new photography hobby. The man that returned to Melbourne felt at peace enough to declare he was ready to beat anybody.